Do you like talking about movies? Do you like Quentin Tarantino? Do you like Pulp Fiction (or have you been meaning to see it)? Well then you're in luck! As I mentioned in my blogging goals, one of my New Year's resolutions is to start live film discussions about important films. 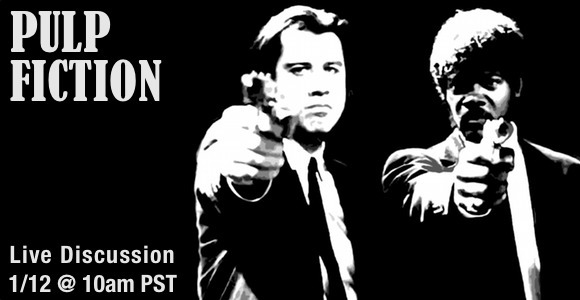 So we're kicking it off next Saturday, January 12 at 10am PST, with a live discussion on Pulp Fiction. If you would like to join us, please let me know and join the Google+ Event so I can get a count of how many people we'll have. We'll be doing this via Google+ Hangouts, which allow up to 10 people at a time to video-conference in. So basically the first 10 people to RSVP will get in! If we have more than 10 (which would be awesome!) I'll make sure to broadcast the hangout so the rest of you can still watch and leave comments as we discuss, which we will do our best to answer as we go. Right now the plan is to do these discussions every 2 weeks, so if you want to get updated on which films we'll be talking about and when, make sure you subscribe to the email list! You'll be taken to another page, and just make sure to click the check box for "Film Discussion Updates." Most importantly, don't forget to watch the film so you're ready to go! You can stream it on Amazon, check your local library, borrow it from friend, whatever it takes. Looking forward to seeing you all next week!